Solar System: Neptune. Creation Testifies! In 1989 a small, unmanned space probe rapidly approached the mysterious and unexplored planet Neptune. Voyager 2 had traveled over four billion miles during its 12-year mission and was about to become the only spacecraft to visit distant Neptune. 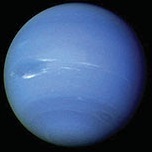 Neptune is the only planet in our solar system that was known to exist before it was visually discovered. The counter-intuitive story begins with the creation scientist Sir Isaac Newton, who formulated the laws of motion and gravity in the latter half of the 17th century. Newton mathematically demonstrated that the motion of planets could be explained by the sun's force of gravity deflecting their momentum into an elliptical path. This accounted for Kepler's laws. But it also allowed astronomers to refine their calculations of planetary orbits to include the gravitational influence of other planets - something Kepler's laws simply could not do. The new physics worked perfectly, correctly predicting the precise position for every planet ... except Uranus. By 1845, the planet Uranus had traversed three quarters of its orbit around the sun since its discovery in 1781, so its path was well known. Its orbital motion nearly matched the mathematical predictions from Newton's laws. But it was not a perfect fit even when the gravitational perturbations of the other known planets were included. What was going on? Were Newton's laws incorrect at such extreme distance? Or was there another planet - an unknown planet - pulling on Uranus? Urbain Le Verrier, a French mathematician, began considering the latter possibility. After many months of intense calculations, he mathematically computed the position that the unknown planet must have in order to explain the discrepancies in the orbit of Uranus. Le Verrier mailed his findings to Johann Galle of the Berlin Observatory. Galle received the letter on September 23, 1846. With the help of Heinrich d'Arrest, Johann Galle visually located Neptune that very evening. The new planet was within one degree of the position predicted by Urbain Le Verrier. This remarkable achievement led physicist Francois Arago to refer to Le Verrier as the man who "discovered a planet with the point of his pen." Urbain Le Verrier insisted he had the right to name the new planet. Following traditional nomenclature, he christened the new world "Neptune" after the Roman god of the sea. The name fits the sea-blue color of the planet and indirectly pays homage to Isaac Newton by sharing the first two letters of his name. At an average solar distance of 2.8 billion miles (over 30 times farther out than Earth), Neptune is the most distant planet of the solar system. Neptune takes 164.8 years to orbit the sun. Physically, Neptune is a virtual twin of Uranus. Both worlds are four Earth-diameters in size and have similar compositions: an icy core surrounded by a thick atmosphere of hydrogen, helium, and small amounts of methane. The methane causes the blue color of both planets. The total known moons of Neptune are 14. Neptune's largest moon is named Triton. English astronomer William Lassell discovered this moon only 17 days after the discovery of Neptune itself. Triton is 23 percent smaller in diameter than Earth's moon, making it the seventh-largest moon in the solar system. In contrast to all other large moons, Triton's orbit is retrograde - opposite the direction that the planet spins. Large moons generally orbit in the plane of their planet's equator, but Triton breaks this rule as well and orbits at an angle of 23 degrees. It is only because Triton is so large that it could be easily discovered at such a distance with 19th century telescopes. All of Neptune's other moons are much smaller and evaded detection for over a century. Understanding of Neptune took a leap forward when Voyager 2 arrived. One of Voyager 2's first discoveries was the detection of Neptune's system of rings. The existence of Neptune's rings had been suspected based on previous research, but Voyager 2 was the first to directly image them. At first, the rings appeared as arcs, only partially encircling the planet. But as Voyager 2 drew closer the rings were found to be complete, though thicker in certain places, which accounted for the arcs. Neptune has five major rings. They seem to be a mosaic of the types of rings encircling the other Jovian (gas giant) planets. Three of them are thin threads, like the rings of Uranus; the two others are broad sheets, like Saturn's rings, but are thin like Jupiter's. The rings are named for people who were involved in some way with the planet's discovery: Galle, Le Verrier, Lassell, Arago, and Adams. Neptune has considerable internal heat, radiating more than twice the energy it receives from the sun. It is hard to imagine how such a process could last for billions of years, but is not a problem for the biblical timescale. Voyager 2 also measured the magnetic field of Neptune and found it to be similar in strength to that of Uranus. This is consistent with Neptune's biblical age of about 6,000 years but is far stronger than what we would expect if the planet were billions of years old, since magnetic fields decay with time. As with the other planets, Neptune gives us a glimpse of the glory of the Lord.